Have you ever wondered how to make a simple Nativity scene? This simple presentation might become your favourite, as it is mine. It can be used as an ‘Advent Calendar’ too.I love this Nativity scene so much that I can’t wait to unpack it each year. Even if one year I decided to go for the minimal theme, THIS nativity scene would be the only thing I couldn’t do without! It all started with a need to pare down. To simplify. But also to be ‘renewed’ after a hectic year. I once sat in a lecture where the presenter challenged us to see Christmas as a time of renewal, and a time to challenge ‘traditions’ – the things we do each year ‘just because’. Each year MUST be a renewal. I am not the same person I was last year, my children are not the same people they were last year, my family as a living entity is not the same as it was last year- and neither are you! Although outwardly, things may look the same, or similar, we can see just how different we are by looking at our ‘tastes’. How we now dress, what we like to eat, the music we like to listen to, our hobbies -all of these things document the changes we make. Sometimes, we can’t believe what we used to like in years previous. We are fluid and flexible and our Christmas traditions can also be fluid and flexible. 2. Determine where you want your Nativity scene to sit – perhaps on a table in the entrance way, or on a sideboard in the lounge room? 3. Drape a long 1.5 metre piece of blue silk (to represent the night sky) from a point up high on the wall behind the table and down so that the blue silk covers a section of the table itself. Sit the basket on top of this. 4. Cover the basket with a second smaller blue cloth so that the muslin drapes into the basket on both sides. My second cloth is a 1m x 1m fine blue muslin square. 6. My Mary and Joseph are simple standing tube dolls, with the slightest touch of embellishment- a plait of wool for Mary’s hair, a 10cm square of shiny blue for her cape (I tacked it onto Mary with tiny darts to hold it on her head), and a white ‘beard’ for Joseph. 7. The cradle is a piece of coarse fleece, sculptured (and somewhat felted) by creating friction in the wool with my hands to make a resting spot for a little one. Don’t you think a simple scene like this is so delightful in a world gone crazy with over-the-top extravaganza and bling? I do. For the final week, we had something made from the ‘human hand’ (Week 4 – Kingdom of Humans) – perhaps a small drawing gift for the child who will soon arrive, miniature clay bricks for a makeshift ‘fireplace’, or even handmade ‘fences’ for the animals in the stable, using lengths of dowel and small tree rounds cut from narrow branches. I also encourage my children to add the treasures they find to the simple Nativity, things such as sticks, shells, seedpods, and once, Ned added a matchbox car! I’m NOT at all fussy. I want this to be a living, breathing, shared effort – not something so perfect my children don’t feel any ownership over it at all. The whole point is to bring something of this story, and the mood of this giving and sharing story into our home without too many religious overtones. It’s such a joy to see it each Christmas. Not long now! Your own DIY Advent Calendar too! 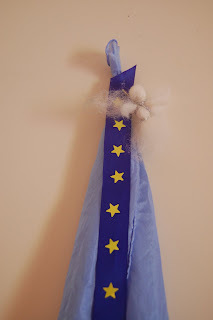 Make your simple Nativity scene into an Advent Calendar too, simply by dangling a wide dark blue ribbon over the top of the silk, leaving the end to drape into the basket. Add 24 miniature gold star stickers (the ones you find in stationery shops) in a line down the ribbon, so that the final star sits where the ribbon touches the handle of the basket. 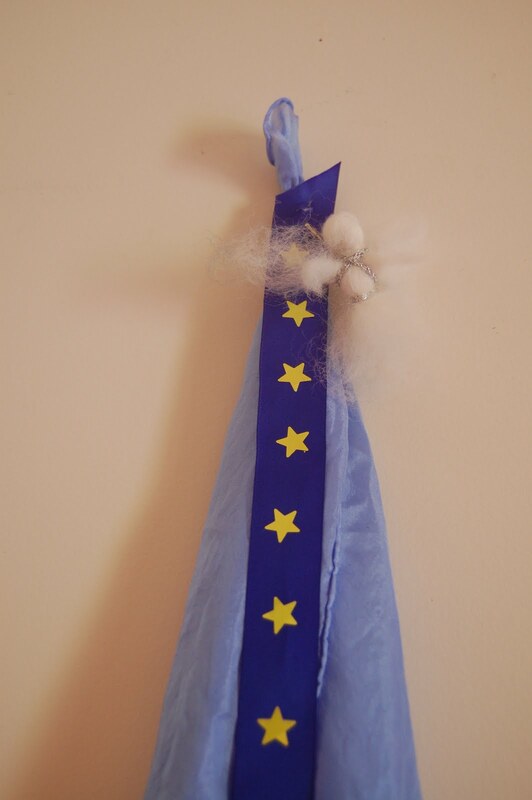 Make a white fleece fairy (adjust the size down by starting with a length of wool fleece about 14 cm long) and pop a safety pin on her back, and then, day by day, move her down from star to star until she appears right above the ‘cradle’, ready to share with the world the wonderful news of a baby being born. A pale blue silk cloth to symbolise the evening sky. One long royal blue ribbon with gold sticker stars to symbolise the journey towards the birth of the royal baby, and one angel travelling down the star path, leading us closer to Christmas. One thing to ponder- I believe the birth of the baby at Christmas time is something to marvel at- as a reminder that every child who is born, no matter what religion, what creed, what colour, what nation – is a royal gift. The birth of any and every child is a way for the universe to say, here is another opportunity to get it right. The young child more than ever today, leads the way for us to live in harmony. The birth of a child is a moment of potential to change the world for the better. PS: Want to know more about the Four Kingdoms of Advent? Read here and here and here and here and here.